April 1, 2010 -- The College of Agriculture and Technology announces the semi-annual Bill and Alice Nix Petting Zoo. 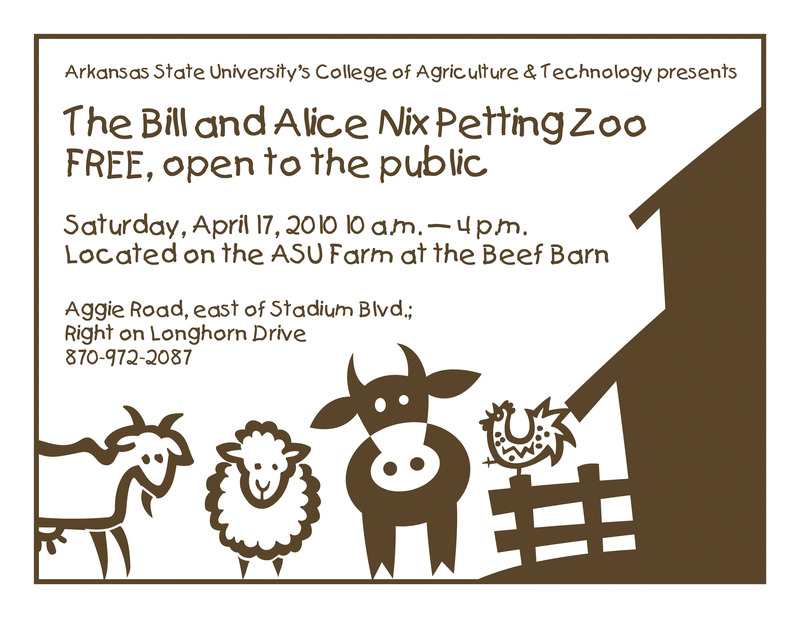 The petting zoo will be open to the pu blic on Saturday, April 17, from 10 a.m.-4 p.m. at the ASU Farm Beef Barn on Longhorn Drive. Please expect crowds; this is a very popular event. For the health and safety of both children and animals, no food, drink, toys, or pacifiers are permitted in the petting zoo. Petting Zoo animals include sheep, goats, pigs, chickens, ducks, calves, rabbits, turkeys, miniature horses, and a miniature donkey. The Petting Zoo also includes free hay rides and horseback rides. On Saturday, Oct. 13, 2007, the College of Agriculture officially dedicated the Bill and Alice Nix Petting Zoo, thanks to the donation and support of the Nix family. The Nix family, sole owners and proprietors of the Ash Flat Livestock Auction since 1958, are now seeing a third generation of family, Melanie and Billy Bob Billingsley, in the business. Not only is the monetary donation significant, but Mike Nix, son of the honorees, will perpetually re-supply the petting zoo with young animals from the auction. The Bill and Alice Nix Petting Zoo will next be open in September during Homecoming week. Any students, faculty, or staff at ASU can volunteer to help. For more information, to volunteer, or to book a school group for the fall opening, contact Sherry Ellis (sellis@astate.edu), Agriculture Studies Office, at (870) 972-2087.